This was the last weekend of April which was a weekend that I was really looking forward to because it was the first week of the Farmers Market! Oh, how I love the Farmers Market! We went to as many as we could last year. I have less to buy there now since I'm growing a lot of my own stuff, but I still like the whole atmosphere there. I hope it continues to grow and expand - the one we had in my hometown in California was huge and I miss it! I didn't buy much this time but I had to have these peonies. I completely missed out on peony season last year and they are one of my all time favorite flowers! On Sunday, I spent most of my day in the kitchen, which I love. I made homemade applesauce, a very healthy blueberry muffin recipe, and a lower calorie (compared to my other one) cajun chicken pasta. 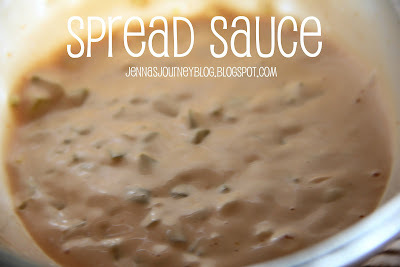 I also attempted a really low fat salad dressing recipe, but that one didn't turn out so well. 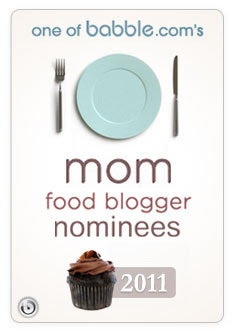 That's the thing about creating your own recipes - some are just a big, fat fail! That's okay though, most of them turn out to be yummy! For the last couple of months it's been harder for me to find time to blog because...we're moving! More accurately, we are building a new home, or as we call it, our "forever home." There will be no more moves after this one! Ha! So, when we went to choose a builder, it was a no brainer for us. We actually built the home we live in now and we loved our builder. It's a husband and wife team and they were so easy to work with and such nice people. It doesn't hurt that they've been in the business for 20+ years and know everything about everything. The other night, we had just put the kids to bed and Chris got a call from our builder. She said she needed a favor from us, which is about the only part of the conversation that I actually heard, so I was dying to know what it was. 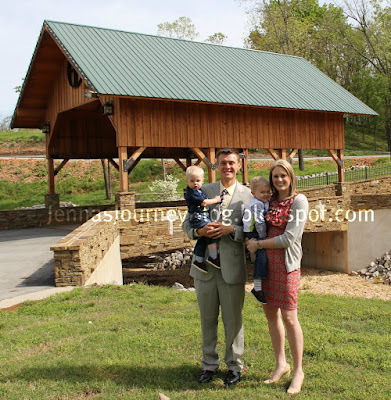 Apparently, they were chosen to be on a home builders show that is featuring 3 home builders from Arkansas. So exciting! They totally deserve it! But the reason she called us is that they needed a couple to speak on the show about them and they want us to do it! We were so honored! As you might know, I am a really shy person. We have done some radio interviews for Arkansas Children's Hospital and even a TV interview once, but that stuff scares me to death. Seriously. But we love our builder and want to tell everyone how great she and her husband are so we signed on to do it! It's going to tape sometime next month from what we know. Anyway, I said all this because I had mentioned it on twitter and some people wanted to know what kind of show it was etc., and it was just way to many words to type out there! Oh, and I'm editing this because I was asked if the show is going to feature our house or building process and the answer is no. We're just there to talk about her and her husband as builders, not to feature our home (I would not be comfortable with that!). Last year we started walking a nearby trail that lead to a lookout point. We would walk a ways up the trail to see the progress being done on a new art museum in our town. Well, this year, the museum is open (though we haven't had a chance to check out the inside yet!) so we are able to take our nightly walks right up to it! See them? So cute. 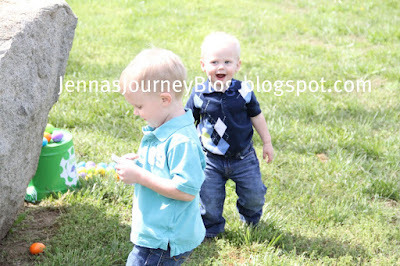 Brayden loves them - he calls, "here deersy, deersy!" I love having these trails so close by. We like walking in our neighborhood but the trail provides a much better workout and there is shade which is always a huge plus in my book! I've been asked about my BOB a few times recently so I thought I'd just post about it here. Yes, we love our BOB! As far as travel goes, especially flying, Maclaren is still my number one choice, but for walking, or going on any terrain that isn't concrete especially, the BOB handles so much better. The front wheel of mine also locks so if you jog with it is doesn't bobble all around on you. I wouldn't know about that from first hand experience. Ha! I know many of you already use Zulily, but if you don't, you should! Everyday there are hundreds of new items on sale for kids, women, decor and home! I've purchased everything from my address stamp, personalized shirts for my kids, snow gear and kitchen appliances through Zulily. Everything is up to 70% off. All you have to do is sign up and then check out the sales each day! To create an account just click here! 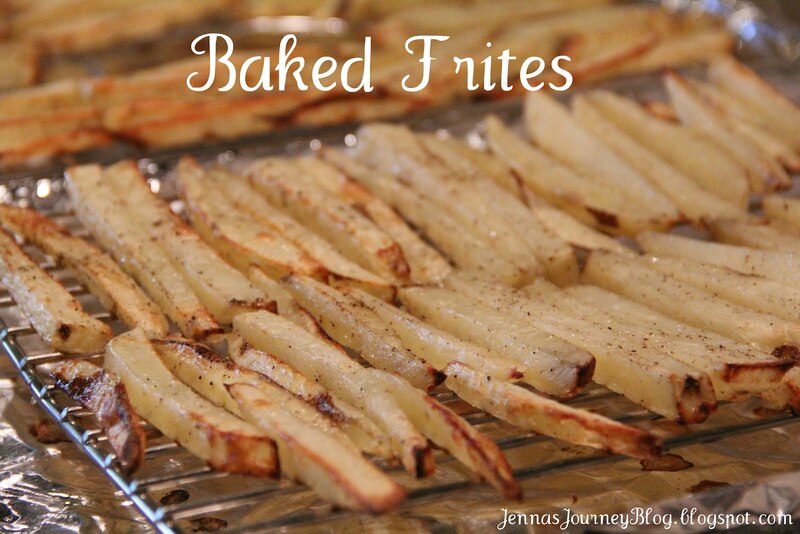 I wanted a healthier french fry for dipping in my Spread Sauce so instead of the traditional fried french fry, I baked mine! You can also do this with sweet potatoes, I just happened to have a few russets on hand. Clean and peel your potatoes (you can leave the skin on if you prefer). Slice them into half inch sticks. Put potatoes in a bowl and cover with water. Let soak for 5-10 minutes then drain in a colander and let dry for 30 mins to and hour (or pat dry if you're in a hurry). Once dry, toss with EVOO and spices. Put on racks that are sitting on lined baking sheets and bake at 425 for 25-35 minutes. This is my mommas recipe for Chicken and Rice. Growing up this was my second favorite thing ever (second only to her Pepper Steak) and it was my brother's very favorite dish. Needless to say, she made is a LOT! 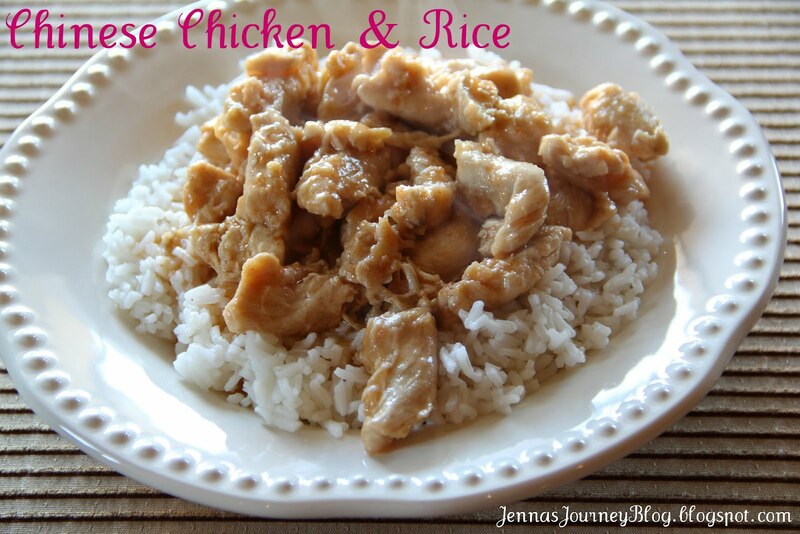 This is different than any other chicken and rice I've ever had or even read a recipe for, and to me, it's simply the best! You can serve it over wild rice if you prefer, but mom always served it on white rice, so that's what I do! Cut chicken into half inch strips. Mix flour, paprika, garlic salt together. Add chicken and toss lightly to coat. Note: Coating should be very light!! Stir fry in hot oil until lightly browned. Add broth, cover and simmer for 5 min's. Combine cornstarch with the next 5 ingredients. Blend well and add to broth. Stir until sauce boils. 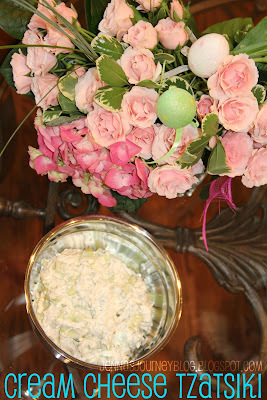 Add peapods, cover and cook until tender crisp about 2-3 min's. 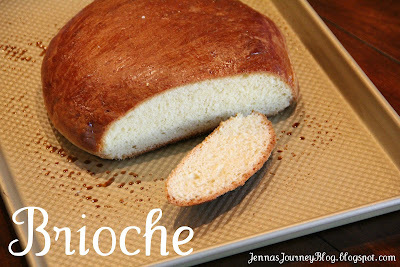 This post was originally just going to be about a Brioche recipe, but you know how I love to share when I find a good product. Brody is a MASTER at dumping his milk out of his sippy cup. He is also a sippy cup addict - he is always carrying one around with him. 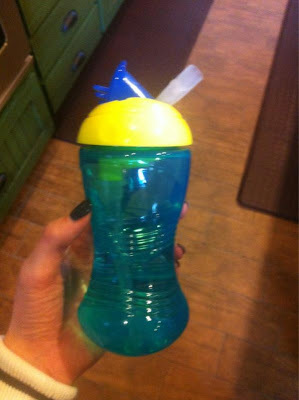 I think I've bought almost every sippy cup on the market and they all leak. Seriously. I should own stock Munchkin. Anyway, I was at Target the other day and they had a new (at least to our store) sippy from Tommee Tippee. It was a 2 pack for $7.99, so I bought it hoping that this would be our answer. We've been using them all week, and so far, not a single drop has spilled or flung out. Brody has seemingly made it his personal mission to do figure out how to spill the contents of this cup but to no avail. So, if you're in the market for a non-spill sippy, you might try this one out. And as a sidenote, I am never typing the word SIPPY again because the stupid spell check on this computer keeps changing it to zippy. Oh, and sorry for the bad iPhone pic. Now, on to the brioche. I'm a big fan of brioche. And can you believe that no one out here sells it?! When we are in Dallas I pick up a loaf at Whole Foods. I have a bread problem. Hi, my name is Jenna and I am addicted to carbs. It dawned on me last week that, duh, I like to make bread. I am not by any means a bread expert when it comes to baking the stuff, but what I make is always edible. So, I actually found a recipe from King Arthur Flour that I decided to try. It turned out really well, and was pretty easy, so I thought I'd share it. Note: I followed the directions for a single round loaf. I'm using mine to make this yummy recipe. *Use 3 large eggs + 1 egg yolk, if desired — this will allow you to brush the leftover egg white on the loaf if you're planning to garnish it with sugar; see tip. 1) In a stand mixer or bread machine (programmed for dough), mix together all of the ingredients to form a smooth, shiny dough. Don't worry; what starts out as a sticky mess becomes beautifully satiny as it kneads. This dough takes longer than most to develop, so be prepared to let the dough knead for up to 15 to 20 minutes in a stand mixer. Also, we don't recommend trying to knead it by hand. If you're using a bread machine, let it complete its kneading cycle, then continue as directed below. 2) Form the dough into a ball (it'll be very soft), place it in a greased bowl, cover the bowl, and it let rise for 1 hour. Then refrigerate the dough for several hours, or overnight. This will slow the fermentation and chill the butter, making the dough easier to shape. 3) Divide the chilled dough into 12 pieces to make mini-brioche; leave it whole for one large round brioche; or divide it in half for two 8 1/2" x 4 1/2" loaves. 4) Place the dough into the greased pan(s) of your choice, cover lightly, and let rise for 2 1/2 to 3 hours, until it's doubled and looks very puffy. If you're making two loaves, it's fun to make simple three-strand braids, and set them in the loaf pans. 5) To bake a large, round brioche: Place the pan into a preheated 400°F oven. After 10 minutes, reduce the oven heat to 350°F and bake for about 30 to 35 minutes more. Check the brioche after 15 minutes; tent with aluminum foil if it appears to be browning too quickly. Brioche should be a deep brown when done, should sound hollow when tapped, and will read 190°F at the center using an instant-read thermometer. (It's easy to underbake, since it browns so quickly!) Remove the brioche from the oven, and after 10 minutes remove it from the pan to cool completely on a rack. 6) To bake the mini brioches: Place the pan(s) into a preheated 375°F oven and bake for 25 to 30 minutes (tent after 10 minutes if they're browning too quickly). Remove from the oven, let stand for 5 minutes, then turn out onto a rack. 7) To bake the loaves: Allow the loaves to rise till they've nearly reached the rim of the pan, about 3 hours. Bake in a preheated 350°F oven for 40 to 45 minutes, tenting with foil after 15 to 20 minutes. To go along with my post on Using Picnik in Google+ I thought I'd do a quickie post on how to make albums in Google+ that are private. Sometimes you don't want the pictures you are editing to be public to your friends/circles. I am not a Google+ expert, heck, I just joined today! But, I did get a lot of questions on this subject and since I figured out how to make a private album, I thought I'd give you the step-by-step instructions on it. 2.) On the left hand side of your screen is a picture of a camera. Hover over that, then choose select Albums. 3.) Click on the album of your choice. 4.) Above the pictures, and under the date, it will say "Visible To". Click the blue text next to it. 5.) Delete any circles, groups, friends etc that show there. 6.) Check the "lock this album" box. 7.) Hit save. Now it should read as "Visible To: Only You". 8.) Repeat with other albums. From what I can tell, that should take care of making your album(s) private! Wow, TWO techy posts from me in ONE day! Ha! I wrote a post awhile ago about how Picnik was closing. They actually close today. I was doing some last minute picture editing when I saw a message that Picnik will now be in Google+. I didn't have a Google+ account so I quickly created one. I logged in and within a minute, I had my own account. So how do you access Picnik via Google+? 1. Create or Log In to your Google+ account. 2. At the top right of your screen is your profile picture. Click it, then click "View Profile." 5. Once your photo is uploaded, roll your curser over it and then click the pencil icon. This will launch Picnik! Use as you usually do! I did a post like this awhile ago (here) and wanted to do another one! 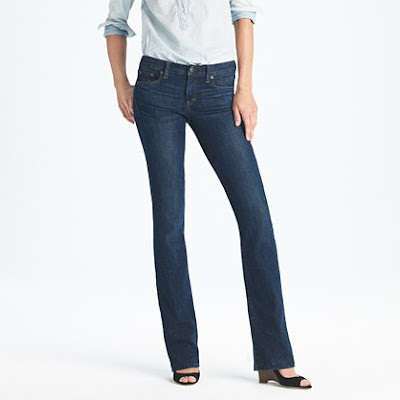 J Crew jeans. I've mentioned that I am a jeans-a-holic before. I seriously wear them almost every day. Last year I stumbled on J Crew's jeans and now it's almost all I wear. They are the perfect fit! I'm so into this. I started last year and I was fairly certain that I'd kill everything, so imagine my surprise when not a single plant died. I actually had to pull my basil and dill plants out because they were growing too fast and taking everything over. I'm going to have to restart them in separate pots because they just get too large for my planter box. Right now I'm growing a variety of herbs, peppers, lettuces and a few root veggie's. So You Think You Can Dance! I love, love, love that show and I look forward to it all year! I also can't wait for Big Brother to start! 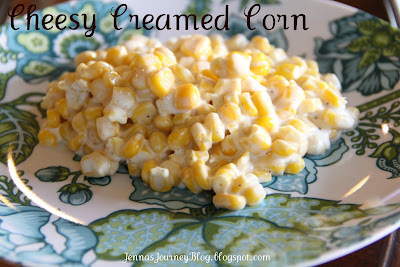 Chris' favorite side dish is creamed corn. I actually set out to make a spicy creamed corn only to realize that I had already used my peppers. So I turned to another favorite ingredient. Cheese! Two kinds of it! In a medium saucepan over medium heat, combine cream, cream cheese, parmesan, butter and pepper (NOT salt). Stir frequently until well combined. Add the corn. Stir often until corn is hot and everything is well combined. Taste for salt (you may not need it since parmesan is salty). 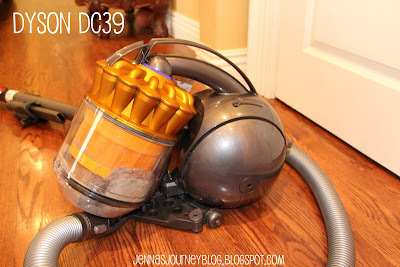 I was thrilled when Dyson sent me my very own DC39! I think I was more excited than a kid at Christmas and a teenager girl at a Beiber concert put together! I anxiously tore into the box…and then I remembered that my handy dandy toolman (aka, Chris) wasn’t home yet. Here’s the dilemma. I do not assemble things. Ever. It’s a rule. Why? Well, two reasons, really. They either end up broken or I end up with a suspicious amount of leftover pieces. 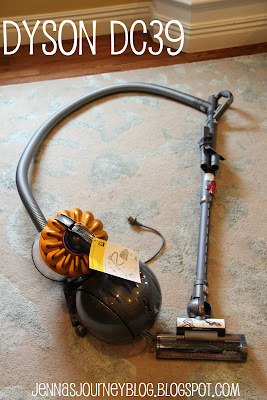 So I managed to wait all of 10 seconds before I decided to just go ahead and unbox the Dyson. Then at least I could look at it. Admire its pretty orange color, you know. I laid out all of the pieces, and because I’m a blogger, I snapped a pic or two. Or twenty. Then I realized that there really weren’t many pieces at all to assemble. So I broke my own rule. And I assembled my Dyson by myself. Guess how long it took me? Yes, I timed myself. Three minutes. And I had no leftover parts and nothing was broken. It took me more time to figure out where my knives go in my butcher block than it took me to assemble the DC39! I didn’t know that the DC39 was arriving that day and because I’m a freak about stuff on my floors, I’d already vacuumed that morning. But what better test is there than to vacuum my already vacuumed floors?! And guess what? This is only from the downstairs of our home. Half of our house. Can you believe it?! The suction in Dyson products is simply amazing! Something else that was interesting to me is that the DC39 practically pushes itself across my floors. I have tile, hardwood, carpet and rugs and it effortlessly glided across each and every surface. There’s a great push button right on the handle that controls the rollers. Also, the cord retractor is a great tool. No more winding up cords – just push the button on the canister and the cord is stored inside of the unit. Also, I mentioned that we have a two story house. Before, dragging my huge central vac unit upstairs was the bane of my existence. The DC39 is lightweight enough that I can carry it one handed all the way up the stairs. Dyson is known for the ball technology and boy did I put that to the test. I can go around the tightest corners in my home with ease. And the power head is a great shape – it fits under almost every piece of furniture in my home. I no longer have to push my couch and oversized chairs up against the wall in order to vacuum under them! Score! Emptying the Dyson couldn’t be simpler. And because it’s a bagless vacuum, you’re not going to get sprayed with a Charlie Brown sized cloud of dust when you open it, nor do you have to spend a ton of money on buying bags. All you have to do is push one button to release the canister, walk it over to the trash and empty it! - One button canister release makes emptying the canister so simple! There is no doubt that I am now a Dyson girl! And with so many options, from the stickvac all the way up to the canister that I have, you can be to! Tell me, which Dyson is your favorite? 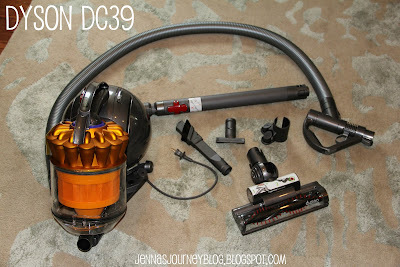 Disclaimer: The reviewer was compensated in the form of of Dyson DC39. Ahhh, french toast. One of the only breakfast foods I'll eat. We have a tradition in our house of making a homemade breakfast of waffles, pancakes or french toast Saturday. This weekend it was my Vanilla French Toast. Combine eggs, milk and vanilla well. Dip bread in the mixture, coating well, then dripping well. Cook a few minutes on each side over medium heat. 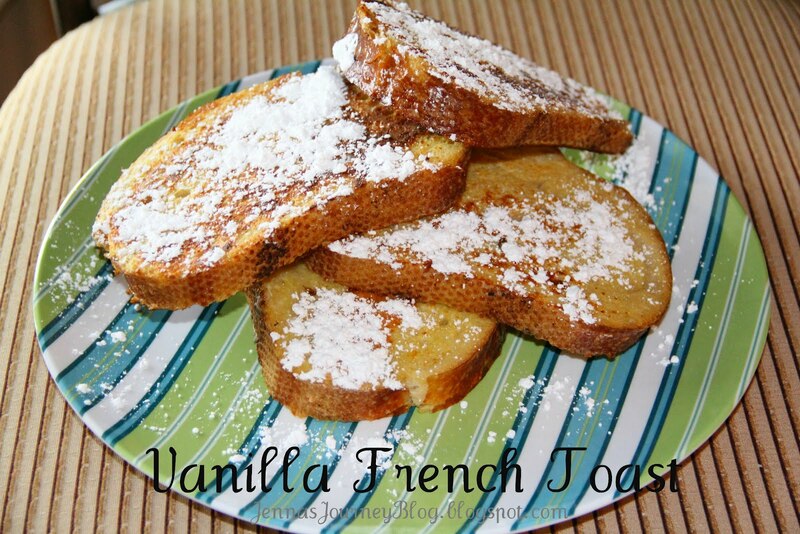 Top with powdered sugar, warm maple syrup and fruit if desired. I love tzatsiki. And I've made it many times the traditional way, but it never turns out just right. I've made a few of the popular Pinterest gyro and tzatsiki recipes, but didn't enjoy those either. I was just about to give up on the whole thing when I went to a restaurant in Joplin and ordered brushetta. Imagine my surprise when they also served us a version of tzatsiki, but it was made with cream cheese! That day I began my mission to make a yummy, non-traditional tzatsiki. Here is the delicious and SIMPLE result! Chop up your cucumber into small pieces, and chop your dill well. Combine with the cream cheese and add salt to taste. Refrigerate at least 1 hour. Serve with pita, or with gyros. 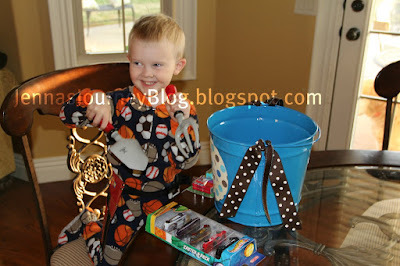 Brayden with his Cars gardening set. He likes to help me plant things. 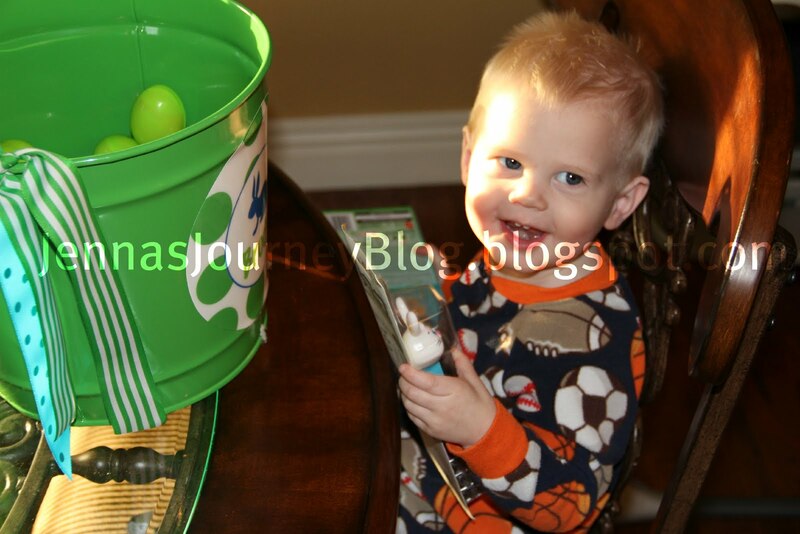 Then the boys hunted Easter eggs. I call this the miracle picture because it's a miracle that both kids are smiling, even if they aren't both looking at me! It was a busy, busy day! Easter is my second (to Christmas) favorite holiday. What a special day with an even more special meaning. Early on Sunday morning, as the new day was dawning, Mary Magdalene and the other Mary went out to see the tomb. Suddenly there was a great earthquake, because an angel of the Lord came down from heaven and rolled aside the stone and sat on it. His face shone like lightning, and his clothing was as white as snow. The guards shook with fear when they saw him, and they fell into a dead faint. Then the angel spoke to the women. "Don't be afraid!" he said. "I know you are looking for Jesus, who was crucified. He isn't here! He has been raised from the dead, just as he said would happen. Come, see where his body was lying. And now go quickly and tell his disciples he has been raised from the dead, and he is going ahead of you to Galilee. You will see him there. Remember, I have told you." Be sure to enter to win a $100 Visa Gift Card! Just click here! Win a $50 Visa Gift Card! You all know how much I love Olay, right? 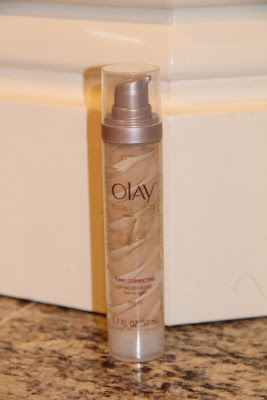 I use Olay products every single day and I have for years! Over the years, it's become so apparent that their products simply work. In my experience, across the board, they are dependable and great for my sensitive skin. And now, I have a new product to add to my Olay arsenal, the Total Effects Tone Correcting UV Moisturizer. Something that I have talked about on my blog before is that after my first pregnancy I developed a few dark spots on my face. I mentioned that I went to the dermatologist and she gave me some sort of a bleaching cream. Oh my word. That was one of the worst mistakes that I ever made. It burned my skin SO badly! I really should have known better and went with my gut that it just wasn't the thing for my sensitive skin, but I didn't know of anything else that I could really do. My makeup foundation didn't offer much coverage for the dark spots and I wasn't aware of any products geared towards minimizing spots or discoloration. 7. Dryness Defense: Reduces the appearance of dryness. You all know how pale I am, so here is a shot of the moisturizer on my hand. Olay has got you covered with three different shade options: Fair to Light (me! ), Light to Medium and Medium to Deep. It goes on smooth and keeps my skin moist and hydrated all day. I wear it underneath my powder for all-day coverage. For me, this is just another way to simplify and improve on my beauty routine. What are some ways that you expedite your beauty regimen? Tell me in the comments for your chance to win a $50 Visa gift card! This giveaway is open to U.S. Residents age 18 or older. Winners will be selected via random draw, and will be notified by email. You have 72 hours to get back to me, otherwise a new winner will be selected. 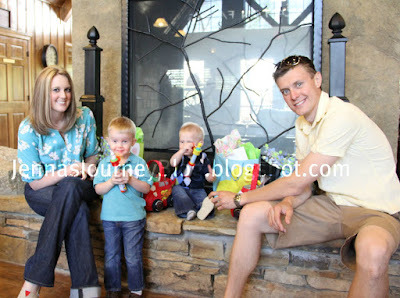 Be sure to visit the Olay TE page on BlogHer.com where you can read other bloggers' reviews and find more chances to win! While we're on the subject of looking good, you might want to check out the "Looking Your Best" posts in the Life Well Lived section of BlogHer.com. There are some great tips and expert posts! I was compensated and provided free product for this post. †The opinions expressed herein are my own. You may have noticed that I have a thing for In-N-Out. That whole "absence makes the heart grow fonder" bit is true. At least when it comes to me and fast food. 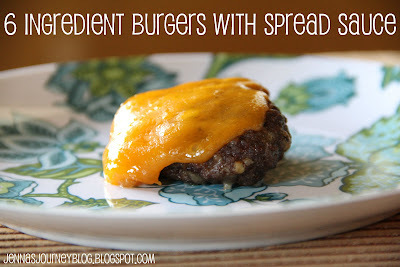 Anyway, I thought I'd share my basic burger recipe with you, mostly because I needed a segue to share my homemade version of In-N-Out's spread recipe. If you haven't ever had it, you MUST try this recipe! Combine all ingredients. Grill. Add freshly sliced sharp cheddar cheese about 1 minute before removing from the grill. I came up with this after spending several hours taking guesses at what might be in it. I think it's pretty close to the original, taste wise. One thing to make note of - Do not use relish. Relish has a slightly sweeter taste and it doesn't taste right in this. Combine all ingredients. Serve with burgers. Or fries. Or onion rings. Or...well, you get the point. I was out working in my garden a few days ago and realized that I haven't posted any pictures of it. Last year I started out with a little bitty, wall mounted herb garden (see here) but I quickly realized that I needed more space. Chris built this garden box for me - it's about three and a half or four feet tall by six feet long, so I don't have to bend down to work in it and my dogs can't bother it! I've got herbs, lettuce, fennel, green onions, chives, and three kinds of peppers growing right now. Parsley! All of the large plants are still going from last year. The new plants are just starting to sprout! It's a learn as you go thing for me, because we didn't have a garden growing up. I really enjoy being able to go to my backyard and get what I need though! The other two large green leafy plants in the top picture are cilantro. I use a ton of cilantro! It's my very favorite herb. I had to remove my basil plant because it was GIGANTIC. I think I'll get a separate planter for it! This weekend started out in Dallas for Chris and I. I had a doctor appointment on Friday there and so we drove in on Thursday night and stayed at the Galleria. We usually like to go to dinner at Fogo de Chao but I got to pick this time, and I choose The Grand Luxe. I love ordering tapas there - we had fried zucchini, fried onions, mini burgers, Asian short rib tacos and jalepeno corn bread. Eclectic, I know. That's how I like to eat! After my appointment, Chris treated me to my other Dallas favorite - In-N-Out burger! With extra spread!!! Ha! And if you haven't heard about In-N-Out's "secret menu," you must check out this article before you make your next order. I am SO getting Animal Style fries next time! We spent the rest of the weekend back home. My dad wanted to take the boys to the John Deere store, so we spent Sunday doing that. Brayden is completely fascinated by John Deere's. Hope you all had a great weekend! Have you ever ordered anything off the secret menu? ?